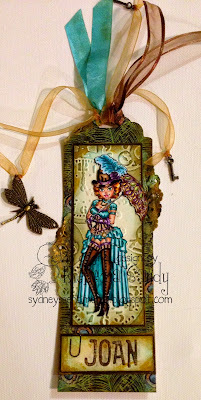 Loves Rubberstamps Challenge Blog: Design Team Favorites for Challenge 145 - Favorite Embellishments. Design Team Favorites for Challenge 145 - Favorite Embellishments. Holly Said: Oh my Heavens what a Masterpiece! That butterfly looks like it is about to take flight off the page and the colors are so fabulous, purple is my fav. Love those purple roses. Love everything about this. Rebecca Said: Love the design of this card as well as the beautiful purples and greens. Her butterfly is awesome, so pretty! Love it! Marcy Said: This is such a gorgeous card! The colors are so rich and that butterfly is amazing. Everything about it is so pretty! 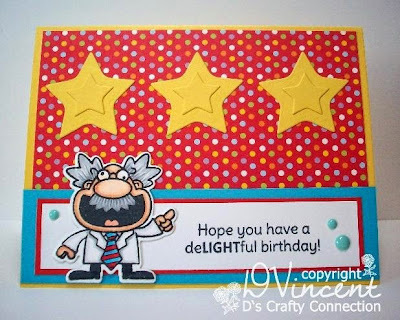 Denice Said: Annie Rose - What an ADORABLE card! 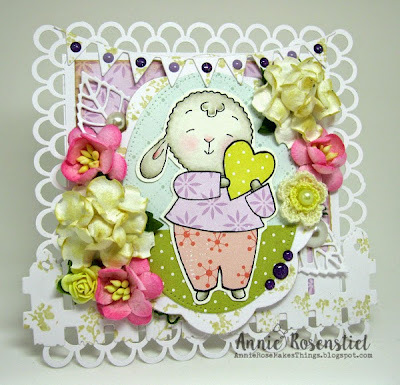 Spring is definately in the air with the wonderful pastel palette she used and paper pieced lamb. Shanna Said: I love the tag, the coloring is stunning, and I love ribbon too. Dangina Said: What a gorgeous background with all the beautiful blooms and different colors! Perfect for Spring..
Holly Said: I love those starts and the fabulous blue dots. This is so super cute. Holly Said: OMGosh the flowers are so stunning and the beautiful doily and die-cuts and rhinestones, this is an embellishment dream. so beautiful.